Welcome to Alan Krakauer Photography! Here you'll find galleries of some of my favorite work. Check below for the latest about additions to the site, new products, and other news. Sorting through years of photos to create a portfolio is an immensely fun but time consuming process. Stay tuned for new galleries, more images, and new edits of older photos. For smaller products like cards and calendars, please visit me on Etsy (AlanKPhotoStore)! Smugmug allows ordering of prints hosted on this site. Until I have a chance to test this out myself, I have this option disabled. I hope to have this service available soon. Until then, If you are interested in purchasing a print, please contact me directly. Please visit the "Prints" tab and check out the gallery there! Finally! What's taken so long? I started this page as a portfolio site, with the intent that everything here would be available to you to take home. That said, when I first started building the site I uploaded a lot of images without really knowing how they would print and I was nervous to let them out into the wild. There can be a HUGE difference in how a file looks on a bright computer screen versus paper, a fact I've struggled with when printing some of my greeting card designs at home. Now I have a better monitor for editing and will start to revisit my favorites and include some files I'm confident will look good on your wall. I'll keep adding them here as I can over the next weeks and months. Please contact me if there is an image you would like to purchase but you don't find it below. Eventually I hope to reach a tipping point where I can reorganize and/or replace the existing galleries with sets of fully purchase-able items. This will mean a lot of reorganization as I reforge the user experience here. I am also planning to do some of my own printing and provide matted photos at in-person shows. These will be fine-art prints on high-quality paper and archival mattes and backing. For other products (Cards, Calendars, and Stickers) please visit my Etsy Store. Check back frequently for new designs and products! I've been excited my upcoming events, and that's inspired me to get some new card designs ready. Many are wildflowers that fit with the theme of native plants and the Bringing Back the Natives Garden Tour events. A few are from a visit to the Gyuto Foundation to catch their cherry trees in bloom. I'll have an entirely new line of product available this weekend as well! Stickers! I'll announce here when they are available on Etsy, or find me at one of the spring festivals and check them out in person! It's here!!!! The winners of the 2018 Nature's Colors contest appear in the April 2019 issue of OP. Turn to page 13, and you'll find my entry, Tundra Slumber. How exciting! This is a magazine I would read cover to cover in the Galen Rowell days, and now to have one of my own photos there!? Wow wow wow! Once again, thank you to the Outdoor Photographer, the judges, and the contest sponsors. And if you haven't already, do check out the amazing photos by the other finalists. 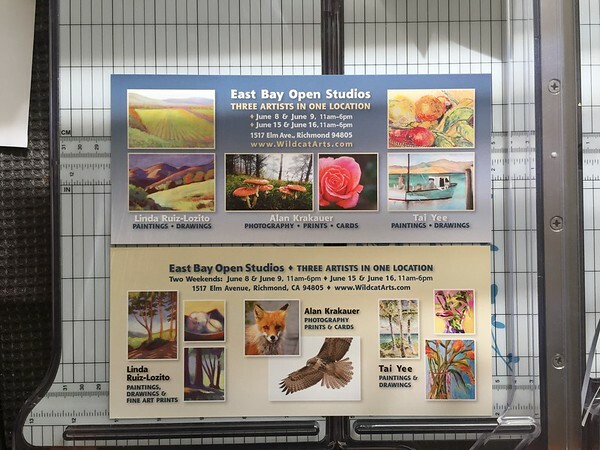 If you've checked out the Events tab, you'll seen two weekends in June (8th/9th and 15th/16th) that are blocked out for the East Bay Open Studios. My neighbor Linda Ruis-Lozito and her friend Tai Yee participated last year. Linda is again generously sharing her studio, and this year I'm joining the party! We'll have art, refreshments, and more! My wife Lauri La Pointe should have some exquisite earrings made from beads, buttons, lace, and Japanese washi paper to check out too. Linda not only makes the studio part of "open studio" happen, she did the design of these postcards. Don't they look amazing?! This open studio will also be my absolute deadline for getting larger prints available. I hope to have them sooner, but I will definitely have some for the opening weekend. It will happen, I promise! Last Sunday we set up a booth at the Kensington Farmers Market just off of Colusa Circle in Kensington. It went great! Watching the weather forecast as the day approached, we were concerned about rain. What kind of moron tries to sell paper goods in the rain? Thankfully the weather gods smiled and we had dry skies all day. The market itself was a lot of fun. 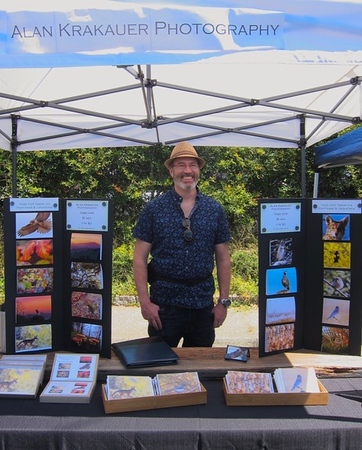 I was a little nervous going in since my previous festivals had built-in friendly crowds, either on home turf at the East Richmond Heights Festival or wildlife-themed like the Wild Birds Unlimited festival. I shouldn't have worried– a lot of people stopped by and I sold a lot of cards and even a few calendars! We knew some of the folks who visited the booth: family, friends, colleagues, and some internet acquaintances who i'd never met in person before. The organizers were super friendly and helpful as well. Needless to say I'll be back! Many thanks to Gene Kitamata and Jacki La Pointe for the photos! I'll be at my first in-person event of the new year this Sunday at the Kensington Farmers Market (Colusa Circle) from 10 to 2. 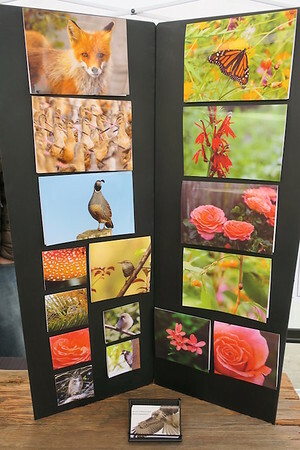 Come by and check out some new card designs, including some photos that would make a perfect card for Valentine's Day. And if you're not in the Bay Area, get your order in on Etsy, where I've got a 10% sale on through Valentine's Day. Last fall, after some encouragement from my family, I decided to enter a couple of photos in Outdoor Photographer magazine’s “Nature’s Colors” photo contest. 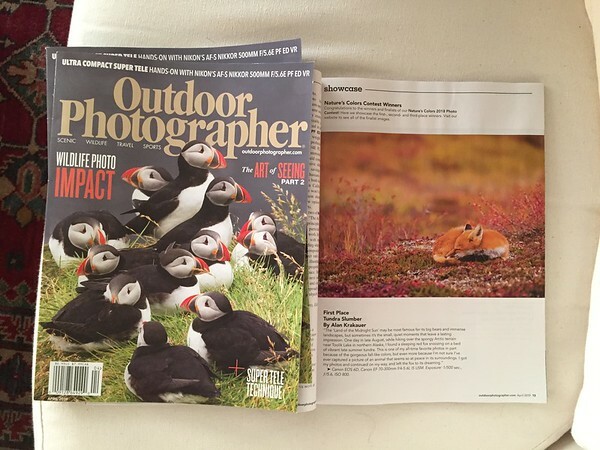 I didn’t have much expectation of winning given the number of amazing photographers who were likely to enter a nationwide contest like this, but I figured it is the kind of thing an aspiring photog should do, and hey, you never know… So I selected a red fox image from my time in Alaska (“Tundra Slumber”) and “Thrush Nirvana” from the 2019 Wildcat Canyon Calendar. Jump forward to late December– I receive an email from OP indicating that "Tundra Slumber" was selected as a finalist for the Nature’s Colors contest. I was over the moon that my photo was selected among the top 25 submissions. This photo has always been one of my personal favorites and so it is exciting that someone else thought it was a special photo too. I’m being completely honest in saying that I thought there was 0% probability I’d end up in one of the top spots (although I did start to visit the Outdoor Photographer site around the time I expected the winners to be announced, just in case). Fast forward again to this week, and another email from OP. I had to scan it a couple of times to be sure I was reading it right. "Tundra Slumber" selected as the GRAND PRIZE WINNER. What? I still can’t believe it. As someone just getting used to putting my work out there and taking the first steps towards photography as a business, this is unbelievably validating. In the 1990's and early 2000's (in the pre-digital days) I was an Outdoor Photographer subscriber, so to have my photo featured there now is incredibly thrilling. A big Thank You to Outdoor Photographer, the contest judges, and the sponsors! I've reduced the price on the 2019 Wildcat Canyon Calendars to $15. Get 'em before they're gone! Also, the shop now has more than 50 items! Some of the recent additions include 2 new card boxed sets (one a colorful autumn-themed set from Wildcat Canyon, and the other a wildlife in snow collection). Perfect if you need to crank out some thank-you cards after the holidays! Stay tuned in 2019 for many more card designs and products. Unfortunately I've had to cancel my appearance at the Crafts Fair today due to illness. I've been fighting something all week and was hoping I'd be better by today, but I've decided not to risk it (both for me and the audience). I was planning to unveil a couple of new box sets of cards at the festival, but you'll have to look for those on my Etsy site now (they should be up soon). To make up for this, I've brought back the 10% off site-wide sale on Etsy through Monday, and there's still free shipping on orders $25 or more. Again, very sorry to miss this event! I am offering FREE STANDARD SHIPPING on orders $25 or more through December 25. For the next week (Through 11/28/2018), I'll offer an additional 10% off all orders! I've just reserved a spot in my next festival– the San Pablo Holiday Craft Fair. This event will take place on Saturday, December 8th from 10AM until 4PM, in Maple Hall (13831 San Pablo Ave) in the city of San Pablo. The festival looks to be quite family friendly. The festival pamphlet I have mentions crafts for kids, face painting, and a snack bar, along with a visit from Mr. and Mrs. Claus from 1:30-2:30. I'll be there with my dwindling stock of 2019 Wildcat Canyon calendars and some new card designs. Get the Wildcat Canyon Calendar! I’ve done a lot more talking up of my Wildcat Canyon calendars on Facebook, but somehow I've neglected to give them their full due here. The calendars are done, and I think they look great if I do say so myself! The 12 full bleed images give a seasonal journey through life in the park and include many of my favorite photos from the past year. Empty spaces in the calendar portion are filled with additional bonus images. You can order them through the Etsy site, or if Etsy is not your thing, feel free to contact me and we can work out a way to get you a calendar. I can take PayPal, credit cards, checks, and for in-person purchases, cash. Even if you don’t buy through Etsy, it’s worth a look at the items there in case you want to buy some cards or card boxes. Another festival success in the books! The Fall Nature Event at Wild Birds Unlimited was today, and we were treated to beautiful sunny but not too breezy weather (even when you are prepared, wind is not the friend of festival tents or small paper products). 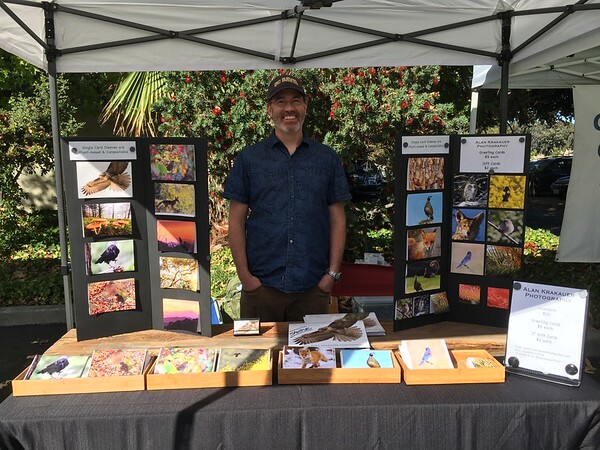 We were one of the first booths to start setting up, and it turns out we were right next to the Contra Costa Avian Society and their Severe Macaw, and also one booth away from the Native Bird Connection and their Bald Eagle! Exciting neighbors for sure. Since the East Richmond Heights festival I've rolled out some new products, and I was happy to see they had some takers. Besides the Wildcat Canyon calendars, I put together some new images, most notably a trio of fox cards that got a lot of looks today. I also unveiled my small gift card designs. It was nice to take on a small festival that was close but not too close just for the experience of knowing we could actually pack everything up in one car and load/set up without any problems. Also wonderful to get to learn more about some of the East Bay's wildlife and conservation organizations. A big thanks to Mike from WBU for letting me participate and for everyone who stopped by my booth. Festival #2 just popped up on my radar this week! Many thanks to the Wild Birds Unlimited in Pleasant Hill for allowing me to join the Fall Nature Event! I'll be setting up a table alongside many great local wildlife and conservation organizations including Mt. Diablo Audubon Society, Raptors are the Solution, California Bluebird Recovery Program, and International Bird Rescue. The wait is over! I've now got an online store open on Etsy. You can find Alan Krakauer Photography products at AlanKPhotoStore. 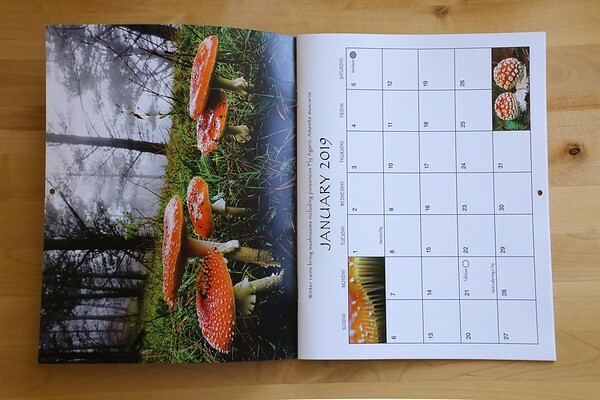 The much-anticipated calendars are available there, and I've also posted about 20 card designs. These include most of the best sellers from the East Richmond Heights festival. I've also added small square gift cards. -If there's a photo you see here that's not yet on Etsy but you are interested in having as a card, let me know! I will continually add products as much as "real life" allows. -At the moment I'm only shipping to the US, but will add international shipping soon. -My plan for prints hasn't changed. When I've had a chance to try out the print-on-demand print houses, I hope to make them available through this site rather than Etsy. My Wildcat Canyon 2019 calendar is off to the printers and my hard proof should arrive early next week. Once I've reviewed it, then printing begins and the end is in sight! I should be ready for online sales then too! It's happening! 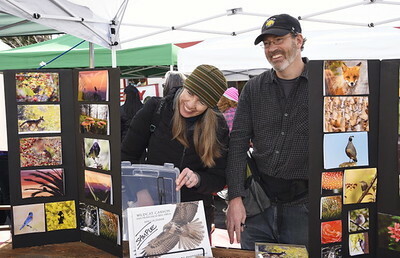 In the mean time, the Golden Gate Audubon Society "Birds of the San Francisco Bay Area" Calendar is available for sale. Obviously I'd love it if everyone bought my calendar, but if you don't, please consider supporting GGAS and buying this one. Now that they have announced availability, I will reveal the photos that made the cut. Both ended up being full page, and one made the back cover! This shorebird image comes from a crazy fall day at Arrowhead Marsh at Martin Luther King Jr. Shoreline near the Oakland Airport. If I remember correctly, I was there to try to find a somewhat unusual sparrow (Nelson's Sparrow, a "life" bird for my list) that was being seen out in the marsh. It was high tide and the wintering shorebirds were looking for a place to wait out the high water. The end of the short boardwalk was free of people, so Willets, Marbled Godwits, and a few other species started coming in to roost. What started out as a trickle turned into a mob of birds, and the front edge continuing to inch forward as the rest of the flock made space for the new arrivals. It was quite a surreal experience to have this carpet of birds flowing towards me! 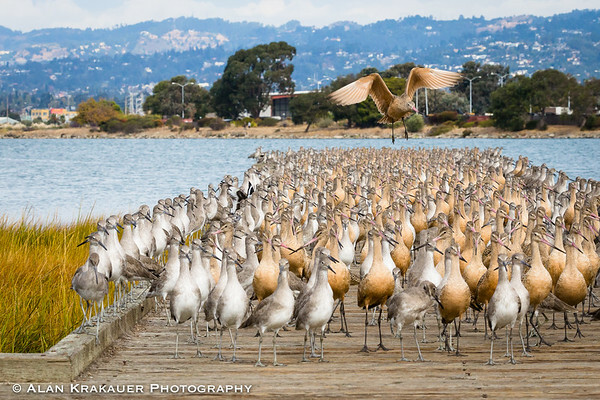 I think this photo also captures the idea that the SF Bay remains a critically important area for both migratory and resident birds, and that we need to make habitat for these species amid all the human development in the region. 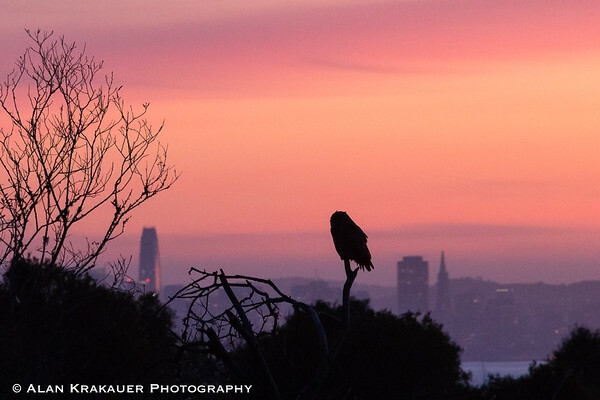 The owl silhouette in front of the San Francisco skyline was taken in Wildcat Canyon Regional Park. I was hiking there with my father-in-law last winter. I typically visit in the morning, but we decided to make an afternoon/evening trek to catch the sunset and hopefully see some coyotes. We were returning from an overlook on the Belgum Trail above the old Belgum Sanitarium. I think I had just remarked that it was unfortunate we weren't seeing any owls when I noticed Great-horned Owl perched not too far off the trail. The colors in the sky were amazing, and I took a few shots before I realized if I ran back up the trail a bit I might be able to get the owl in the foreground with San Francisco in the background. Luckily the owl stayed put for my maneuvers, and I was able to make this shot before he flew off to look for dinner. It was dark before my father-in-law and I made it back to the car, but on the way back we heard or saw a couple more owls, had a skunk cross right in front of us on the path, and watched a coyote run down a ridge near us in the twilight. This photo appears on the back cover of the GGAS calendar, and I also chose it for the December image for my Wildcat Canyon calendar! 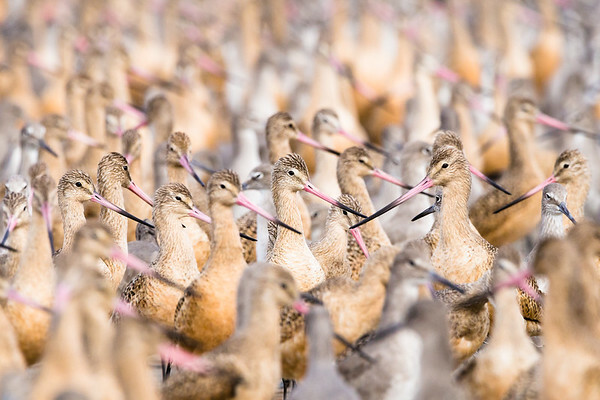 Bay Area Bird Photos Selected! Returning to town after a couple of weeks of travel, I found an exciting piece of news waiting for me in my inbox. A couple of months ago I responded to Golden Gate Audubon Society's solicitation for photos for their 2019 Birds of the Bay calendar by submitting three images of local birds. I've been a member of GGAS for much of my 20 years in California, and regularly participate in one of the Audubon Christmas Bird Counts that they organize each December. This past year I became a docent for their Bay Trails education program. In short, GGAS is a great organization that I like to support. I've provided them with photos in the past but I had never had any selected for their calendar... until now! Apparently I have not one but two photos in the 2019 calendar! I'm not going to spoil which ones until GGAS announces availability, so stay tuned to find out. Now back to the final edits on my own calendar! Facebook and Instagram accounts are now go! You can reach them from the small icons at the bottom of the page. I also figured out how to upload photos directly from Lightroom on my computer to Instagram, which will make sharing images a lot easier! Follow me at these places for more news about new photos, products, and shows. 2018 ERH Art and Music Festival a Huge Success!! Yesterday was my very first time selling my work, and I couldn't be happier with how it went! The booth looked great and held up well in the wind. I met lots of people who were as excited about Wildcat Canyon Regional Park as I am, and opened the eyes of some others who didn't know how much cool stuff there was to see in their local open space! I was really encouraged by all the great feedback I received on my images. Thanks to everyone who stopped by. The selling part went well too! I actually sold half of the single cards and ran out of several designs. I even got my first order! I want to give a huge thanks to Natalie Kniess for organizing the East Richmond Heights Art and Music Festival and to all the volunteers who made the festival go. Also many thanks to my wife and her family for a ton of help, advice, and support. I don't always end every sentence with an exclamation point but it was just that kind of day. Sunday, July 22 will be the public launch of Alan Krakauer Photography! I will have a sales booth at the East Richmond Heights Art and Music Festival. 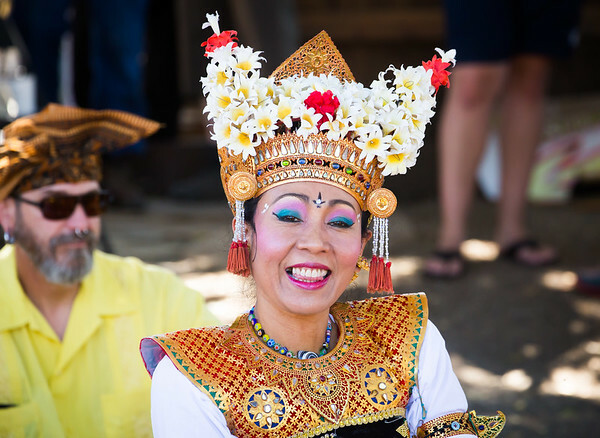 The festival, which runs from 11AM to 7PM, features local artisans, musicians, and dance troops. The inaugural event in 2017 included a few food trucks, a tiny (but ride-able) steam train, and access to the adjacent Gyuto Foundation Tibetan monastery. I had a great time as spectator and photographer (in fact, I donated most of the publicity photos the organizers are using this year). I'm over-the-moon excited to have my first festival booth. This week I'm giving my printer a workout getting ready. For my first go I'm keeping it simple. I'll have a selection of 5x5 and 5x7 note cards, as well as some boxed sets of 5x7 cards. There will be images from Alaska to Wyoming, but most of the emphasis will be on local scenes and critters, especially from neighboring Wildcat Canyon Regional Park.